...which makes it look more like a normal chemical firearm than most normal chemical firearms do, is vapourised rail and projectile material. This is a serious problem for both military and... hobbyist... railguns. Damage to the projectile is not that big a deal as long as you're only firing "kinetic kill" lumps of metal, not explosive-filled shells. But a gun that needs to be torn down and have major components replaced every few shots is not a practical weapon. There are actually analogous problems with a lot of other unreasonably powerful guns. Truly monstrous artillery like railway guns (often, confusingly, also referred to as "rail guns") could fire only a few hundred rounds - even with WWII technology - before the whole huge barrel had to be replaced. 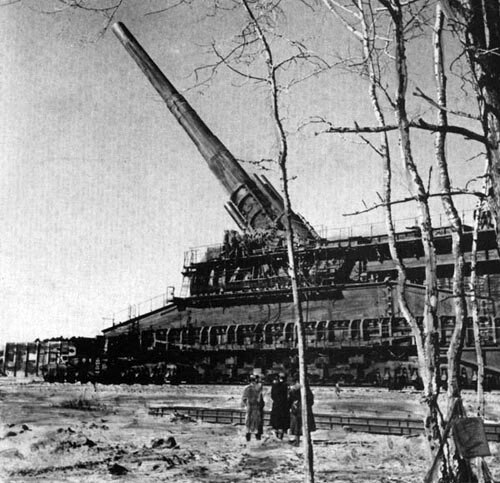 At least one of those railway guns, the World-War-One Paris Gun, had a series of shells of gradually increasing size to be shot in order, so the bullet always fit the barrel. For comparison, the 16-inch guns on the Iowa-class battleships were good for a feeble 355 million joules or so, and three hundred or so full-power firings before the barrels wore out. In their later life those mere 16-inchers became rather more destructive than any of the railway guns, though, on account of how they could toss fifteen to twenty kilotons of instant sunshine at the enemy. And then there's the multi-chamber gun concept, where the initial propellant charge behind the shell is relatively small, and the barrel has branches containing subsidiary charges that are timed to go off after the shell has passed them. 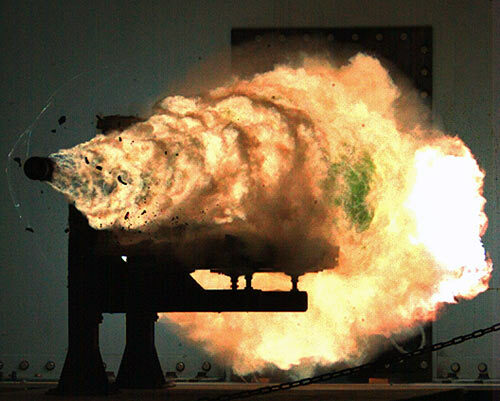 This design lets you have very high muzzle velocity without beating up the barrel, or the shell, with a single immense propellant explosion; multi-chamber guns could be used to launch satellites, as well as to kill people. But nobody's ever really gotten them to work, which is, I think, in most cases just as well. It seems that the number of rounds a firearm can fire before wearing out is inversely proportional to the caliber. My .22-caliber rifle can take tens of thousands of rounds, while a .223/5.56mm can do 10-20k rounds. I wonder if the cost per round made such a weapon worthwhile, though. A B-29's payload (9 tons) exceeded the shell size of Gustav (7 tons), and was a lot more capable of hitting targets that didn't have the decency to stand still while the Germans built several hundred yards of rail for the super guns. Of course, the B-29 came much later in the war, but still. Perhaps it was just the Nazi's affinity for overly large military vehicles? Not to mention Hitler's love of ludicrously large architecture. You've got to remember that the Nazis were the ones who fielded the most impractical weapon of the war - V-2 missiles. Having the dubious honor of having caused more deaths indirectly to the side that built them than directly to the side they'd smash into, they were quite a testament to the irrational megalomania that possessed Hitler and many other high-powered nazis concerning weaponry and, well, everything else. 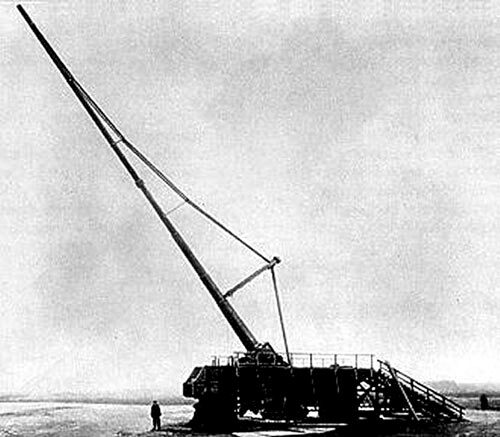 The fact that they actually started building the Ratte, and even considered in any practical sense the Monster (which, coincidentally, was to have a Schwerer Gustav gun as shown in the main post), should put any remaining doubts to rest. Probably more like inversely related to muzzle velocity and energy, higher caliber at the same energy level would increase barrel life. Your .22lr will be firing a 38-40 grain round at 1000-1400 FPS. .223 would be 40-60 grain or more, 3000+ fps. .22lr being lead rather than copper jacketed probably makes a slight difference, but I doubt it's significant. In the V-2 defense, they were often sabotaged by the forces labor prisoners tasked with putting them together. I have always wondered, what are the multiple vertical streamers commonly seen in these things? Smoke from rockets sent up immediately prior to hitting the red button. Used to visually assess the explosion at various altitudes.